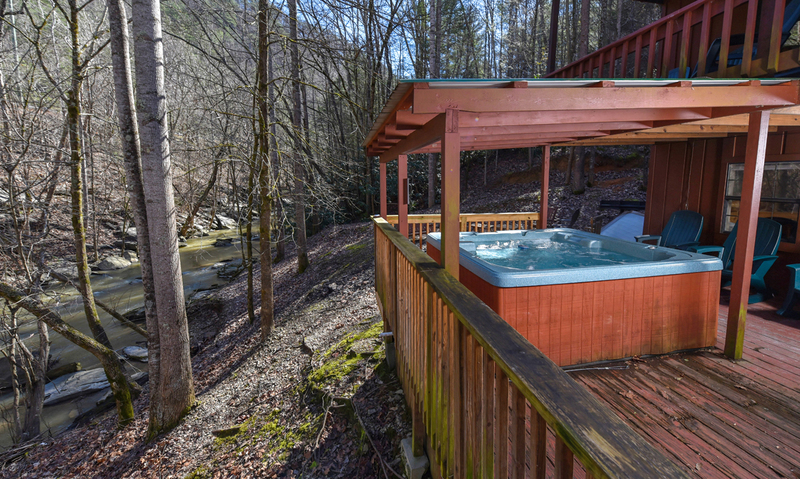 Situated on the banks of a peaceful creek, this spacious and comfortable 7-bedroom, 3 ½-bathroom cabin in Keaton's Bear Cove Creek Retreat community has space for up to 17 guests, gorgeous wooded surroundings, and a blend of mountain charm and the cottage feel. 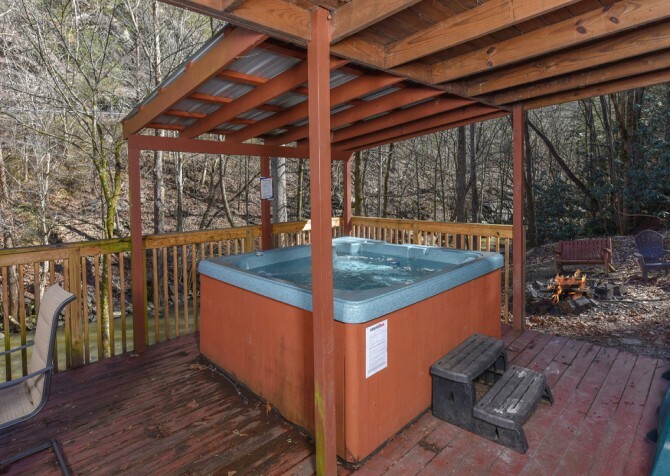 You’ll feel right at home with all the modern amenities and comforts, along with some fun perks and awesome outdoor spaces to really enjoy the Great Smoky Mountains. In the kitchen, find the dishes, appliances, and space you need to make meals for the whole group. You’ll have multiple dining tables and plenty of extra chairs, along with picnic tables and seating outside. 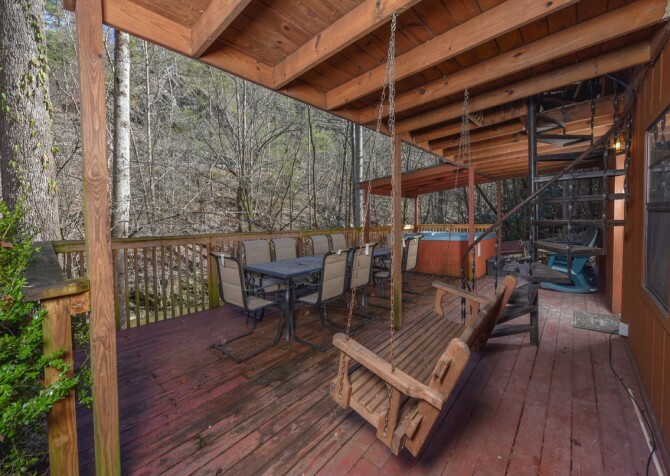 Create your favorites in the kitchen, or head outside on the deck to fire up the grill for a fun group cookout — creekside! 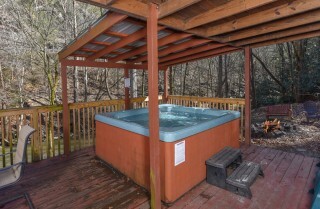 Here you’ll also find rocking chairs and a hot tub where you can really relax and unwind. 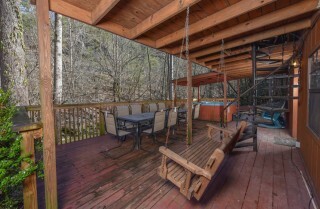 And at night, bring tasty s’mores ingredients and sit around the firepit to snack and chat. 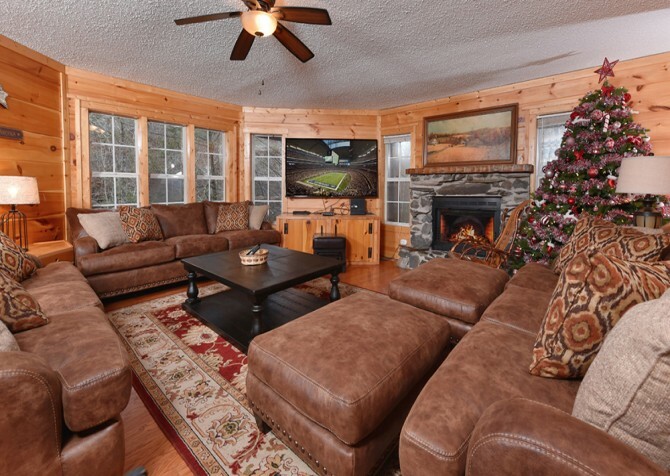 Back inside, shoot some pool and relax on the sofas while you wait between turns. There are king, twin, and queen beds throughout the cabin, making it easy to sleep whatever group you’re traveling with. Want more? How about TVs in the bedrooms, an indoor jetted tub, wireless internet, and a washer and dryer?! Get ready for nothing but great times and even better memories with family and friends at Keaton’s On the Creek. Cozy cuddles on the sofas, entertainment on the big screen TV, and rousing rounds of pool await in the charming living room at Keaton’s On the Creek. This large space boasts hardwood floors, high ceilings, plush seating, and 2 pub tables — it’s the perfect room to gather the whole gang for board and card game tournaments (brought from home), morning devotionals, and family chats. Step into the fully equipped kitchen at Keaton’s On the Creek and whip up family dinners, epic feasts, and midnight snacks in a flash — thanks to the stainless-steel appliances, pots and pans, dinnerware, cookware, mugs, and more! All you need is fresh ingredients from town, and you’ll be set. Brew coffee, toast bagels every morning, and microwave popcorn for game nights. Mere feet away lies the spacious dining room with 2 large tables plus extra seating around the room, meaning everyone can easily gather at mealtimes. Keep the kids (and kids at heart) entertained with the big screen TV and switch on the electric, heated fireplace to set the mountain mood. This space is also right off the riverfront deck, where an outdoor table expands the space and provides additional seating options in nature. 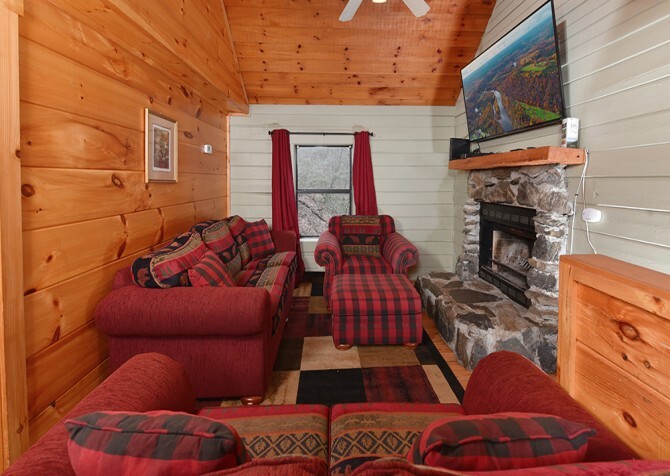 Spread across the cabin, you’ll find 7 bedrooms — each with comfy bedding you’re sure to appreciate while touring the Great Smoky Mountains. 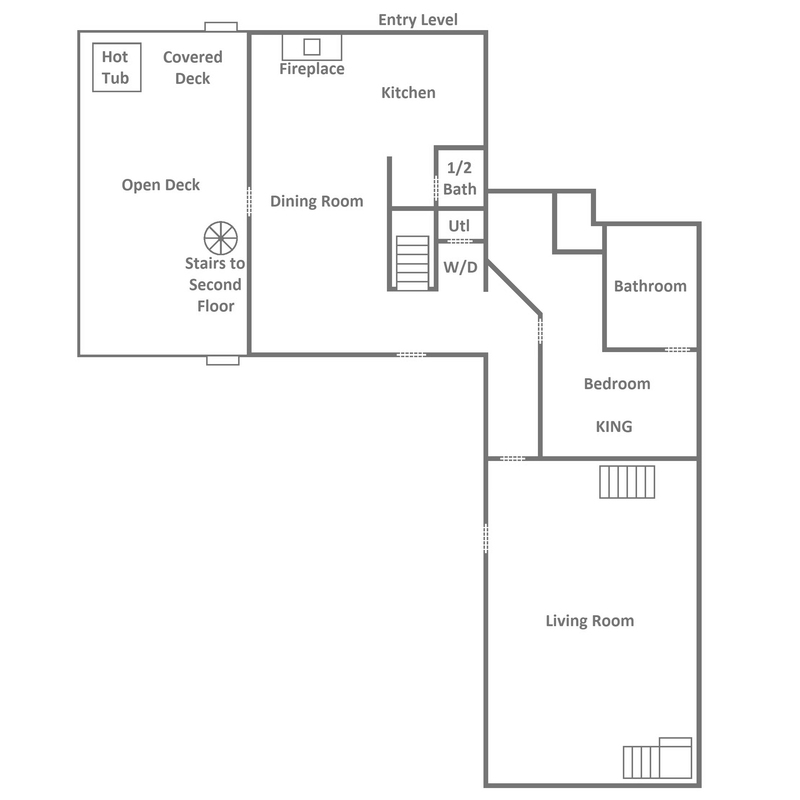 On the entry level, the master suite awaits with a king-size bed plus an indoor jetted tub in the en-suite bathroom. 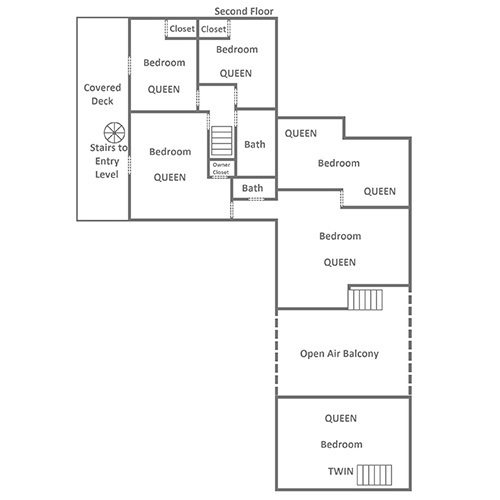 Upstairs rests 4 additional bedrooms, 3 with a queen-size bed and 1 with a king-size bed plus a queen. 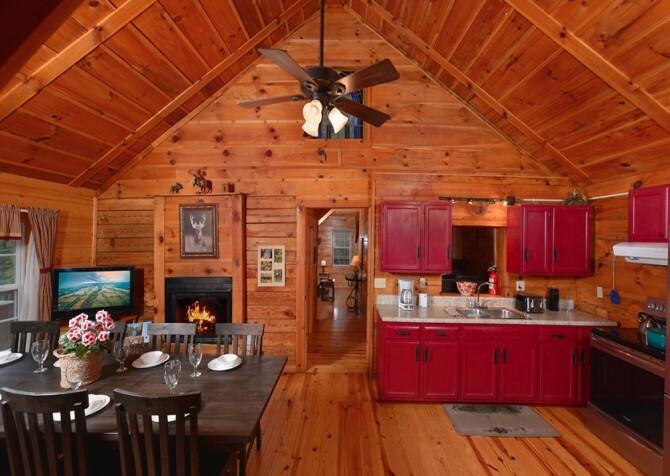 There are also 2 loft bedrooms, 1 with a queen-size bed and the other with a queen-size bed plus a twin. Most bedrooms even provide a large flatscreen TV, giving you and your guests entertainment 24/7. 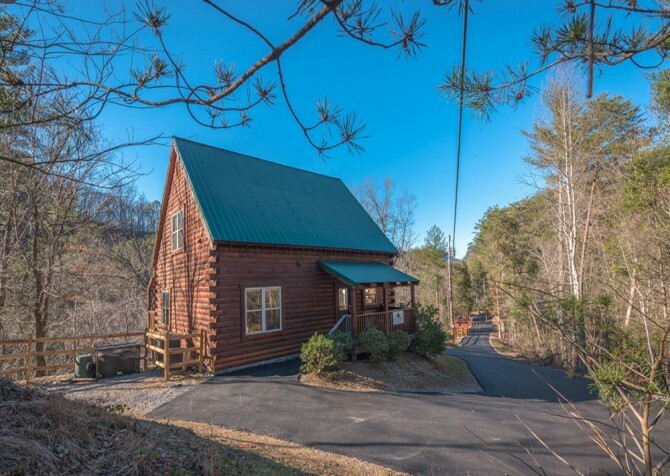 As you pull across the quaint bridge over Cove Creek, you’ll find the flat, paved driveway to Keaton’s On the Creek with parking for 5-6 vehicles. 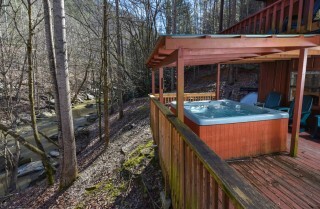 Hear the rushing river run past as you walk easily to the semi-private cabin’s front door with no steps in the way, making unpacking the cars a breeze. Feel free to check out the fun outdoor spaces before heading inside. Rest on the porch swing, plan for grilled meals (charcoal, picnic-style grill provided) at the outdoor dining table with prime river and woodsy views, and get ready to soak in the steamy hot tub every evening! Head up the spiral staircase to the upper deck for even better creekside views from the rocking chairs. There’s even a firepit, perfect for crisp fall eves and fun summer nights. And that’s not all. At Keaton’s On the Creek, you’ll feel right at home with a provided washer and dryer to keep clothes and towels clean throughout your stay as well as complimentary Wi-Fi to post pics and vids of your national park adventures! 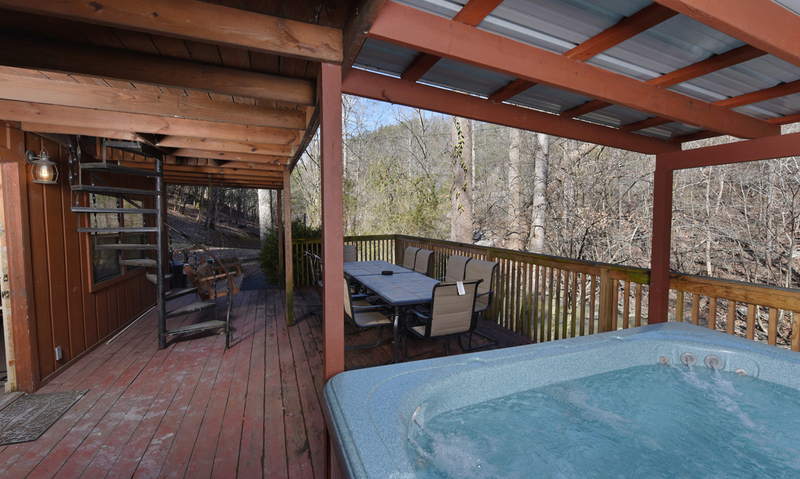 Close to Pigeon Forge fun (less than 6 miles away), Keaton’s On the Creek is convenient to say the least. Not only do the extra cabin amenities and riverfront views make your stay more than worthwhile, its location will keep guests happily entertained within a few minutes’ drive to exciting attractions. Zip through the Smoky Mountain trees at incredible heights, over wandering wildlife and lively plants, and into thrilling memories at Wears Valley Zipline Adventures, less than a mile away! Round up your best mates and attempt to break out of prison, find Clyde’s gold, or solve an art-thief mystery at The Escape Game on The Island. Become the enchanting witch or wizard you’ve always wished to be as you unlock secrets and solve puzzles with your magical wand at MagiQuest.